It was hanging by the strap from the vacuum cleaner. I would have found it the next day (no, really! ), but it had managed to hang there for three days unseen. Still don’t buy it? 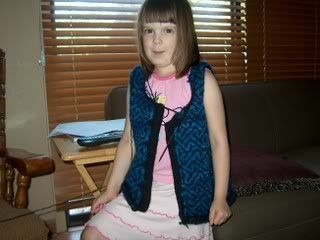 OK, here’s a vest with a Boo Bug (Finder of Lost Cameras) in it!! 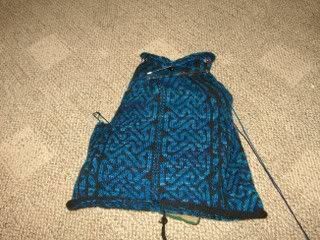 I made a slight modification to the vest, which was to leave off the cable pattern in the button bands. I did this for two reasons: although I like it in the picture and on the sample vest Cheryl had in her booth, when it was staring at me from my needles I thought it looked excessively ‘busy’ – and since my buttons aren’t “plain” buttons but kind of ornate little things, I decided to go with ‘plain old black’ and let the buttons “pop” a little more. With luck and a tailwind, I’ll finish it this week. I haven’t had a whole lot of ‘sitting down knitting’ time, thanks entirely to housework (boo, hiss!) (overrated! OV-ER-RAY-TED!) and Denizen uprisings (they seem to think they should be fed, like, two-three-five times every single day! the nerve!) and so forth and so on. Whenever you have something you really want to do, that is when you have about a gazillion people stopping by, twenty commitments to church, friends, and family, and all of your immediate family/children coming down with horrible sicknesses. It's not Murphy's Law, it's worse than that. I call it Old Mother Hubbard's law. You are hilarious! You could write a book any day- I'd buy it on the spot- the way you write just makes me laugh out loud(probably because I remember every situation...! )My kids are older than yours-they are boys 15 and 14 this year, and girls 12 and 10. 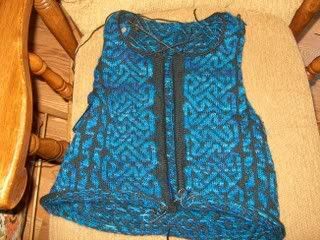 I'm a stay-at-home mom, with a husband working away for long periods, so often I feel like a single mom...There will be time for knitting...eventually...LOL. By the way- I love the look of your vest! Great job.